Here's a killer calf workout using one simple calf exercise. You don't need any special equipment, just a step or a ledge. The only exercise you'll do is 1 leg calf raises on a step, and here's the workout. 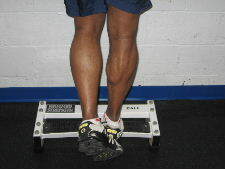 Begin with the right calf, and do 25 repetitions of the one leg calf raise. As soon as you're done with the right leg, switch over to the left leg and do 25 repetitions. Then, without any rest go back to the right leg and do 20 repetitions, then 20 on the left. Then, without any rest go back to the right leg and do 15 repetitions, and then 15 on the left. Now you can rest and stretch out the calf muscles. But the workout is not done. Rest 3-5 minutes and then repeat the sequence. 25, 20, and 15 reps.
Nope not done yet. Repeat the sequence a third time-- 25, 20, and then 15 reps. This is a truly killer workout for the calf muscles. It's a great workout for anyone who plays running or jumping sports, and it's a great workout for anyone who wants to strengthen and build their calf muscles. If this workout is too difficult to get through, you can modify the repetitions and shoot for 20, 15, 10 or 15, 10, 5. You can also decrease the rounds from 3 rounds to 2 rounds. This is a simple workout. Start with 25 reps on each leg, then move to 20 reps on each leg, and finish the circuit with 15 reps on each leg. Rest for 3-5 minutes and then repeat the circuit 1-2 additional times. Make sure you stretch your calf muscles after this workout.